RICHMOND, Va. (AP) – Virginia agriculture officials say a newly introduced invasive insect has the potential to seriously impact Virginia’s grape and orchard industries. 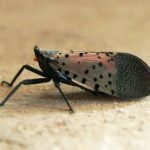 The Department of Agriculture and Consumer Services issued a statement Wednesday urging landowners to help manage the spotted lanternfly. The insect was first detected in Virginia at a stone yard in the Winchester area in January. The statement asks landowners to inspect trees and plants for signs of the insect and report potential sightings to their local extension offices or to the department. The department says early detection is vital for the management of the pest. The first U.S. detection of the insect native to China, India and Vietnam was in 2014 at a Pennsylvania business that imports stone products.